Insert a balloon into the tube, and pierce it with two solid spikes. The balloon does not 'pop,' but remains inflated! 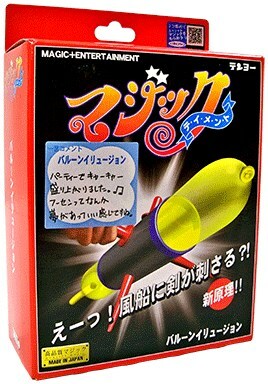 Show the inside of the tube, and your audience can see two spikes penetrating through the center of the balloon. Remove the spikes, and show the balloon to be completely, and amazingly unharmed. BALLOON ILLUSION utilizes a brand-new principle that defies detection. The new method feels and looks absolutely fair, as if no gimmicks could possibly be involved. This is truly the ultimate version of the balloon penetration effect. Your audience will shriek when they see you thrust spikes through the balloon. This trick has built-in tension and intrigue, and of course, an amazing conclusion.